Each morning (over tea no less!) we decide upon our destination for the day. Yesterday it was the Museum of London, and because John and I do museums differently we go our separate ways almost as soon as we enter and meet later at a pre-arranged time. To give you some idea of how diverse we are, John got as far in the exhibits covering the period 850AD in London while I made it all the way to the Black Death. ;-) We're already planning a return visit to continue learning about London's history, as well as see the special exhibit devoted to "the man who never lived and will never die" - Sherlock Holmes. Using the grey cells may be easy for Sherlock, but it's rather exhausting for us so mid-afternoon we headed to a pub and discovered the Sutton Arms. I wish it had a website I could share because the fish and chips were superior to what we had in Whitby. It was simple yet perfect and hands down our best meal in the UK so far. Today we decided on touring the Geffrye Museum. It focuses on the home and the way people have lived for the past 400 years. There are period rooms beginning with the 1600s and moving forward to modern day. John was naturally drawn to the furniture while I focused on discovering what it might have been like to live back then. To tie in with the season each room was decorated as it would have been for the holiday season. Did you know the Puritan-based English parliament banned Christmas from 1644 until the restoration of the monarchy in 1660? The ban even included mince pies and holly! Another interesting tidbit I discovered is tea was introduced to Britain in 1658...and it was London coffee houses that were largely responsible for the English becoming one of the world's largest per-capita consumers of tea. On the walk back to our flat I spotted some storage containers stacked on top of each other. I grabbed John and set off to investigate. The photo below shows it during construction. 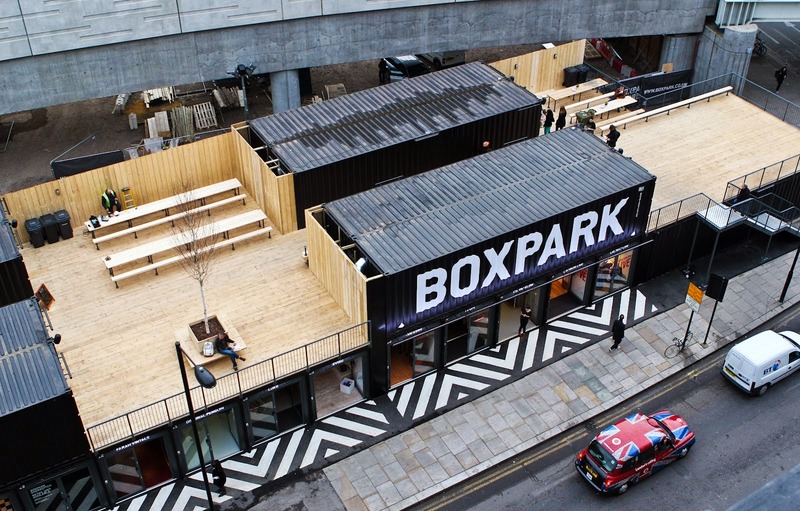 BoxPark is a "pop-up mall" made entirely of shipping containers and it's been at its Shoreditch location since 2011. The builder has stated it will remain on site at least until 2015, but I hope it becomes a permanent fixture if only because of its uniqueness. The area on the left of the two black containers (above) is now completed and fitted with tables, benches, umbrellas and a Christmas Tree. I stood by the Christmas tree to take this next photo. The entire top floor is devoted to food and drink stalls. The ground level is a normal mall with everything from knicknacks to eyeglasses, clothing and shoes all displayed within the space of a shipping container. Another couple of brilliant days in London - everything from banned to boxed!